Elysium was established in December 2016 and aims to be a vibrant, forward-thinking and values-led organisation. We offer a wide range of services: child and adolescent, neurological, forensic mental health, and clinical settings such as eating disorders. Some sites are psychologically led, such as a ‘full immersion’ DBT service and nationwide learning disability services. 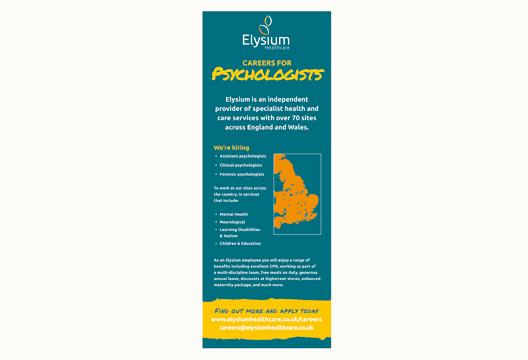 We offer a clinical specialism for every psychologist! Elysium is fast becoming one of the country’s largest independent healthcare providers and continues to grow. In a CQC report for Chadwick Lodge, our Psychology Service was described as ‘outstanding’: having such a good service means we invest in it and grow it. Psychologists are at the heart of our approach – providing assessment and treatments directly to service users and ensuring our culture is more psychologically minded. We’re committed to career development. For example, we have recruited psychology graduates as Healthcare Assistants who work alongside multidisciplinary teams. Some have gone on to work as Assistant Psychologists and then on to accredited BPS training, which we have supported via a Forensic Psychologist in Training route or offering placements to students on clinical and forensic doctorates. We’ve created various grades for qualified psychologists such as Senior, Principal, Consultant and Lead. Some psychologists feel there’s a glass ceiling in the NHS and other settings, so these offer real career progression opportunities. We look to retain experienced staff, offering benefits such as flexible working patterns, including working from home. As a Head of Department, I focus on developing staff. Recently, team members have attended various internal and external training, including Intensive DBT, Compassion Focus, Graded Exposure for PTSD and specific assessment tools. Elysium conferences have covered these such as learning disability and sexual offenders. I believe we have a positive, supportive, genuine values-led culture. We put service users first and are collaborative, reflective and have a strong learning ethos. We welcome ‘can-do’ attitudes… a positive mindset. The successful candidate will get along with teams; be reflective; be principled but also be able to cope with very complex and challenging clinical presentations. And have problem-solving skills in abundance! If I were looking to convince someone to apply, I would say that our values and positivity speak for themselves! We have patients’ wellbeing and progress at the heart of all we do. Those values drive how our Psychologists are invested in, supported and developed across their whole career. It is a fantastic place to work!